Features and Benefits: Low modulus natural rubber latex allows for reduced hand fatigue over long periods of wear. Lightly powdered with USP absorbable cornstarch for easy donning. Longer than typical latex exam gloves. 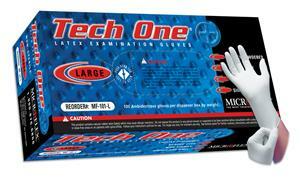 The Tech One® glove is the glove of choice for many professionals because of its premium quality and comfort. Its smooth outer surface provides a more natural feel. And Tech One® is lightly powdered for easier donning. So when you need durable protection and premium quality choose Tech One.